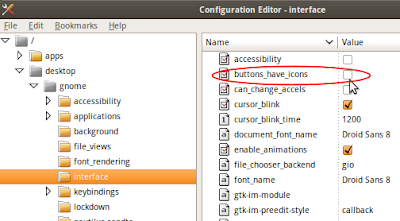 Re-enable Missing Icons In Ubuntu 9.10 - OMG! Ubuntu! 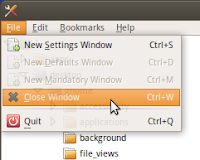 One minor cosmetic change in Gnome 2.28 – which is the basis of Ubuntu Karmic Koala – has resulted in many users being left confused and wondering if there is a rather blatant bug in Ubuntu. 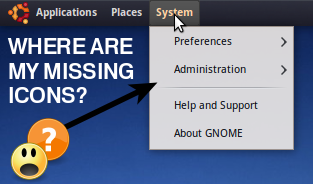 I’m referring to the “missing icons” in the Places and System menu’s in Ubuntu. The missing icons aren’t actually missing – they’re just ‘disabled’ by default! The Gnome “usability” team have come to the conclusion that the icons in the menus specified (System menus and the bottom entries of the ‘Places’ menu ) would gain a strong visual improvement sans the icons. If you’re a fan of them then the good new is that re-enabling them is just a click or two away. Go to the ‘Interface’ tab. Check “Show Icons In Menus”. A quicker way to get to the appearence menu is just to right click on the desktop and select ‘Change Desktop background’. It’s not just these menu entries that have “lost” their icons. Clickable ‘buttons’ in windows and application menu’s no longer have icons, either. A common complaint about GNOME is that it has a certain fetish for icons. Menu entries, buttons – everything has an icon attached to it which often wastes space needlessly by making buttons larger than they need to be, as well as menus wider than they need to be. With menu icons and the current default without menu icons. The current approach is that some items have them, and some don’t, and this is because no artist had time to draw it, or because the action is too complex to convey in a small icon, or both. And hand to heart, that’s not a really good guideline. As such, and keen to create a visually stunning desktop, the decision was made to axe the button icons. 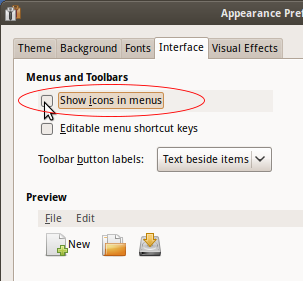 To enable Menu icons check ‘Menus_have_icons’.